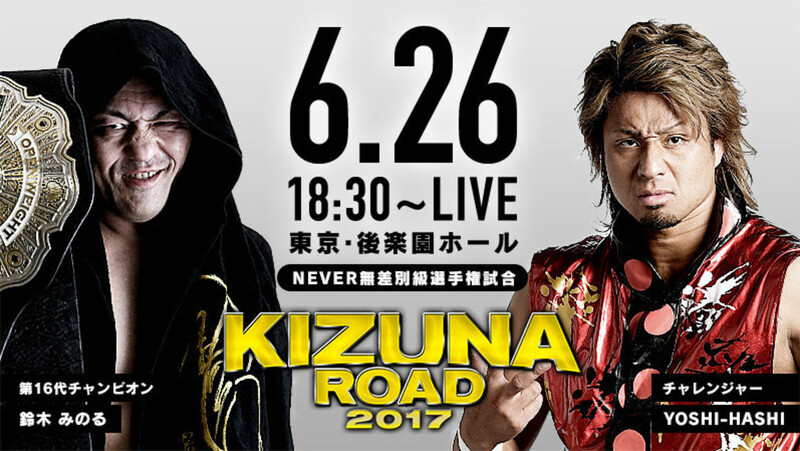 The Kizuna Road tour returned this morning for a big main event at Korakuen Hall. We not only had some young lions matches and your usual tags, but also a NEVER Openweight title match with Minoru Suzuki defending against YOSHI-HASHI. They had a solid opening match -- standard stuff you’ll see in the usual young lion match. Both seem to show a lot of promise, with both of them continually improving as time goes on. Once it went to a draw, Umino went to pick up Yagi, but he’d have none of it, and they butted heads for a bit before leaving. The locker room segments that were seen on the previous Kizuna Road show made their return here. An announcer guy tried to interview Suzuki in the Suzuki-gun locker room, with the kind of results one would expect. This was also solid. The crowd got into it towards the end as Kitamura was doing power spots, including a gutwrench suplex. Oka had the advantage and was landing some near falls when the bell rang, ending the match. Oka wasn’t done and continued working on Kitamura as both eventually had to be separated. Announcer guy was back, this time with YOSHI-HASHI, who was all alone in the CHAOS locker room. YOSHI-HASHI politely answered the announcer’s questions. This was Kawato’s match to shine. As far as the young lions go, he is probably the overall highlight out of the current bunch in terms of intensity. He scored a number of big near falls on Kanemaru which got the crowd hot for him. Kanemaru came back with his DDT finish for the win. Nagata and Ishii had a really good back-and-forth brawl. Nakanishi and Yano came in, then Nakanishi and Nagata worked on Yano together. An errant clothesline by Nakanishi into Nagata gave Yano ample opportunity to low blow Nakanishi and roll him up for the win. Match lineups will be announced on tomorrow’s show. Desperado had the stretch muffler on Gedo at one point until Okada broke it up. DBS grabbed Okada and prevented him from entering the ring again, allowing Desperado to score the win with an Angel’s Wings. This match was full of solid action, but it was nothing too memorable. It was basically a showcase for Los Ingobernables. I did like one spot where Taguchi went to roll up SANADA in a ball, but he then exited the ring frustrated because he couldn’t get the job done. EVIL submitted Finlay with what looked like a chicken wing sleeper hold. This was one of those Suzuki-gun matches where the constant interference spots superseded everything, making you really wonder why New Japan makes their refs look so incompetent in trying to keep a match going without any interference. Once that all got settled, however, this turned into a pretty good bout. YOSHI-HASHI was seconded by Okada, while Suzuki had Desperado, Kanemaru, Taka Michinoku, and Taichi. Okada proved his worth early, fending them off as YOSHI-HASHI bailed to the outside after taking some stiff kicks. Suzuki responded by grabbing the referee and walking away, leaving the heels to gang up on the faces. I didn’t know it was that easy. Suzuki took YH and beat him down in the crowd, pelting him with steel chair shots. It turned into a wild mess where Suzuki laid out Okada and the rest of the heels picked apart YOSHI-HASHI. Suzuki gained control, but when going for the Gotch piledriver, YH countered into a back body drop. YH came back with the butterfly lock, but the rest of Suzuki-gun interfered. Okada cleared house again, but Davey Boy Smith Jr. laid him out. Smith went for the Bulldog Bomb, but suddenly the rest of Chaos emptied out of the locker room, finally evening the score! YOSHI-HASHI sent Suzuki down with a sleeper and hit a senton, but Suzuki kicked out. He locked in the butterfly lock. Suzuki writhed in pain, but had trouble making it to the ropes. After being in it for a long while and teasing several times like he was going to submit, Suzuki managed to get one foot on the ropes. Suzuki flew back with a dropkick, evening the odds. The two had a slap battle, with Suzuki winning. He put on the sleeper, then nailed YH with the Gotch piledriver to retain the title. Suzuki cut a promo to end the show.